My trip-of-a-lifetime to Vietnam yielded wonderful experiences with the hill tribes of Northern Vietnam. The amazing thing about meeting these women from rural communities was their elaborate clothing. The Hmong tribes are one of the biggest groups in the area and are further broken down into groups like the Black Hmong, White Hmong, Flower Hmong, Striped Hmong, etc. 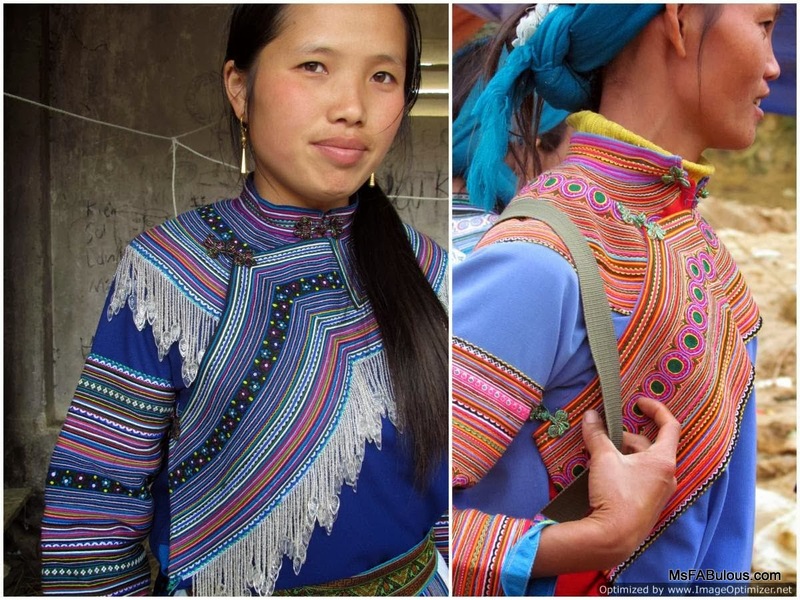 The Flower Hmong are famous for the colorful embroidered garb that they wear. The color combinations that I saw were gorgeously complementary. There were combinations of neon, sorbet colors, violet and blues... Many included beaded fringe along the shoulder and chest. Some had head wraps of colorful tartan. The colors were so bright, I can’t imagine some of them existed hundreds of years ago as the history of their clothing suggests. The image of these elaborately dressed women were particularly striking when you saw them coming toward you through the mud, rain and mountain sized animal droppings on the road in their pristine outfits. piece at the front and back, embroidered arm embellishments and tied back hair or hat. Many families live in homes without electricity in farm communities. However, a lot of the women who worked as guides or vendors had the latest phones (plus accessories). Inside their traditional jackets, I observed many of the Hmong women sporting the latest pop culture tees or bedazzled with fashionable studs. I also loved the bright wellies on this group above during a rainy day. I saw women with intricately carved silver earrings and necklaces. Unlike embroidery or weaving, jewelry is a craft dominated by men. The men hand-tool or hammer out the patterns onto the metal. A signature piece of jewelry for the Black Hmong is a large carved silver hoop around their neck that often has multiple silver chains dangling from it. Jewelry is often a wedding gift or family gift for significant locations. How is that for a statement necklace?